Syrian army forces have successfully regained Qara border town located near the strategic al-Qalamoun area, the state media has reported. The operation to push foreign-backed militants out of Qara began Friday morning. The town, which is located near Syria’s border with Lebanon, was used by militants to smuggle arms to the capital suburbs. The so-called Syrian Observatory for Human Rights group said al-Qaeda-linked al-Nusra Front militants pulled out of the area. It said al-Nusra Front fighters, loyal to al-Qaeda Chief Ayman al-Zawahiri, and members of al-Qaeda’s Islamic State in Iraq and the Levant vowed to attack Qara soon. 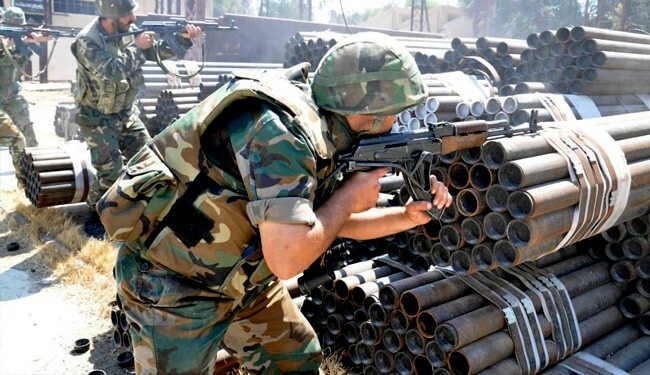 A reporter for the private Lebanon-based satellite channel Al-Mayadeen reported that Syrian troops have already begun dismantling mines and explosives planted by the militants inside the town. The channel showed soldiers on patrol searching for booby traps. Syrian army has been making considerable achievements in its operations near the capital Damascus, while they have also been able to recapture two towns and a military base around the northern city of Aleppo, which is a main stronghold for the Saudi-backed militants.